La Crosse Central's Bailey Kale (6-0) with beautiful driving hoop to tie things up with Cedarburg at 15. Half: Butler 36, Middle Tennessee State 31. MTSU closed half on 9-1 run after trailing by 13. "Kobe K drives a Prius" a sign in the Cedarburg fan section. King has 3 points thus far, Cedarburg leads, 18-15. #wisbb 4:00 left in 1st. Cedarburg attempting to limit possessions and shorten the game by running offense very high on college court. Half: La Crosse Central 21, Cedarburg 18. Red Raiders with 6-0 run in closing minute or so. Cedarburg's John Diener and La Crosse Central's Bailey Kale each with 10 points in first half. Kobe King has 7 for Red Raiders. Kobe King has quite taken over. Six quick points in second half and 10 in team's 12-2 run. #wisbb . Central up, 27-20. Kobe King w/ three pretty drives to open the second half for Central. Also, don't know if Diener has scored since King started guarding him. Kobe King with 10 points to start second half for La Crosse Central, which leads Cedarburg 31-26. King with 17 in game. King hit a couple beautiful fadeaway jumpers but Diener did nailed a 3 coming off a screen. King was feeling it, & picked up a charge. Kobe King taking it to another level right now. He is up to 16 in the 2nd half and 23 for the game. Red Raiders up 39-28. John Diener with an in-your-face triple for Cedarburg. He has 18 points now for Bulldogs, who trail 39-31. 2017 WG Jordan Johnson (6-4) with a triple for Cedarburg, pulling the Bulldogs within 43-39 of La Crosse Central. Freshmen Jordan and Jonathan Davis are excellent contributors for La Crosse Central. Red Raiders won't be disappearing in 2017-18. Lengthy discussion b/t officials & Madison La Follette FB coach Scott Swanson, one of the scoring table operators. Score adjusted to 48-41. 2018 F Matthew Barber (6-7) playing very well tonight for Cedarburg. 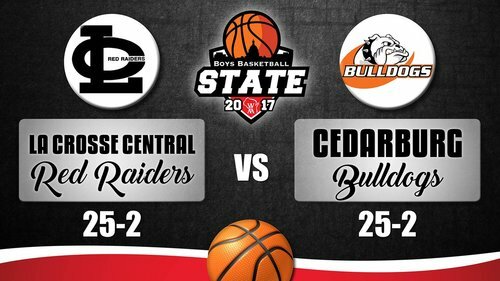 His triple pulls Bulldogs within 49-46 of La Crosse Central with 5:30. John Diener up to 20 points and Cedarburg now trails La Crosse Central 49-48 with 4:45 remaining. La Crosse Central ball out of timeout. Once down by 11 points, Cedarburg has cut the La Crosse Central lead to 49-48 with 4:45 to play. Scoreboard, by the way, went nearly 6 minutes with a point on the board that didn't belong. King 2-pointer was credited as a 3. Jared Short of Cedarburg takes a charge on Bailey Kale. Short might lead Wisconsin in charges taken. King doing everything well, except shooting free throws. Just 2-6 today. 77% shooter on the year. Jordan Johnson's three-pointer gives Cedarburg a 50-49 lead with 2:48 left.